What does SellerZen count as an order? We define one order as one Amazon order and all of its related transactions. An order on Amazon can be identified by a string of 17 digits, something like 123-1234567-1234567. All other unattached transactions are imported without any cost to you. Settlements and reimbursements for issues like lost inbound or warehouse damage are imported for free! 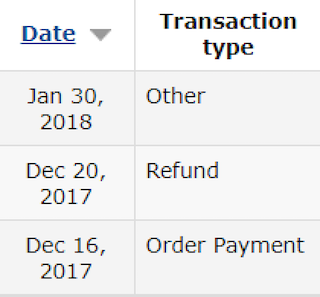 Some Amazon orders may have multiple transactions. For example, the order pictured below includes three associated transactions: an order payment, a refund, and a reimbursement (Other). Even though there are three transactions, we only count this as one order. If transactions take place 30 days after the customer payment, you won't be charged extra because our service will know that the transactions are related to the same order.